Shaw carries a full line of stainless steel flat bar in multiple thicknesses and widths. We stock a large inventory of 304 and 316 stainless steel flat bar. We make it easy for you to select the length of your stainless steel flat bar to meet your project specifications. We provide a large selection of high quality, stainless steel flat bar products in 304 and 316 stainless steel. Available in multiple thicknesses and widths, we can facilitate the needs of your project’s specifications quickly. Click here to view our stainless steel product offerings. We stock a high volume of stainless steel flat bar to quickly facilitate our customer’s specifications. See the attached product dimensions. Click Here. 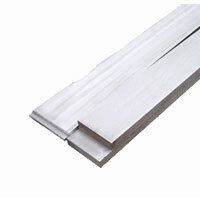 ASTM A276 flat bar manufacturing can consist of a cold or hot finished square process. Other specifications are ASTM A479, ASTM A484, ASTM A582, ASTM B473. standard specifications chart.